John Lloyd Clemente led the Bullpups with18 points. 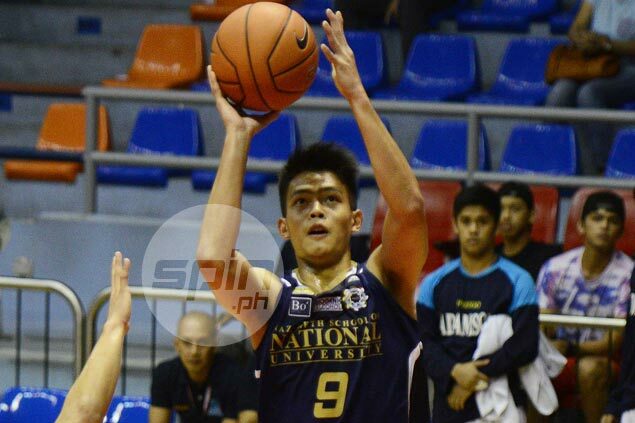 REIGNING UAAP champion National University outscored fierce rival Ateneo by 20 points in the first quarter and coasted to an 84-76 win to clinch the first final berth in the SMART-PCABL 3rd Invitational Cup 2016 at the Buddhacare gym in Quezon City. With John Lloyd Clemente, Michael Alonzo and Win Coyuga leading the way, the NU Bullpups took a huge 26-6 lead in the first 10 minutes of play before padding it to 47-25 at the end of the first half, a lead that stood until the final buzzer. Clemente led the Bullpups with 18 points while Coyuga put on an impressive all-around performance with 14 points, five assists and a block to emerge as the Best Player the Game. The Eaglets rallied in the fourth with SJ Belangel scoring 12 of his 32 points but they ran out of time. NU will face either top seed Chiang Kai Shek College or De La Salle-Zobel in the final of the tournament presented by Smart through Sports Marketing’s Epok Quimpo and supported by CW Home Depot, Power House, Insular Square (Cebu), Advanced Solutions, Inc., New Pioneer Auto Supply and Hapee Toothpaste. DLSZ forced a playoff for the other final berth by beating twice-to-beat CKSC, 68-67, in their own semis series – thanks to the 19-point effort of Martin Romero.